Basking sharks are the 2nd largest fish in the world! 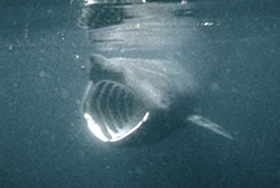 If you are lucky enough to see a basking shark please report it to us at THE MANX BASKING SHARK WATCH. 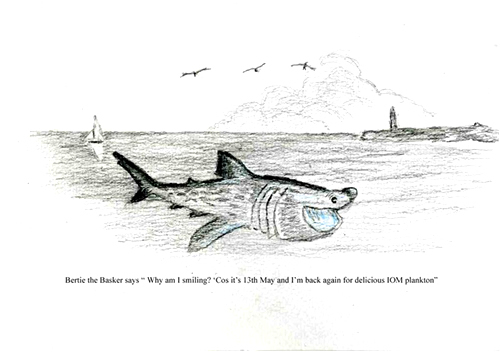 If you write a really good short story about the day you saw a basking shark we would like to put it on our website. 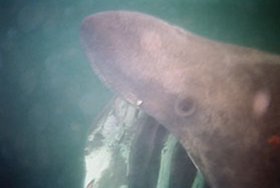 Click on the links below to find out about geographical distribution, external features, physical characteristics of basking sharks, size, weight and sexual maturity, skin and basking shark brains! Basking sharks are the second biggest fish IN THE WORLD! The biggest is the tropical whale shark. 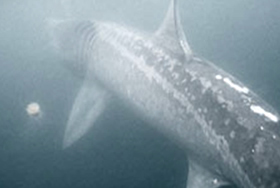 The biggest basking shark ever was 13.72m long. This is longer than a bus! 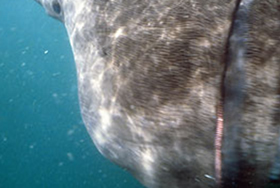 A newborn basking shark is 1.5-2 m long, that’s bigger than a grown-up seal! 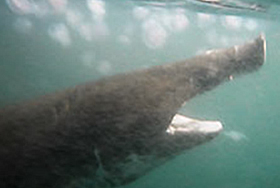 Basking sharks are born in litters of about 6 pups. A pregnant female must have a very big bump before she has her babies! Basking shark brains are very small for such big animals. 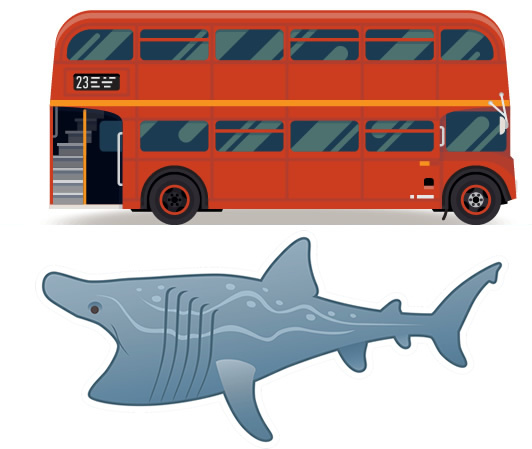 The main part of the basking shark brain is about the same size and shape as a hotdog in a bun! 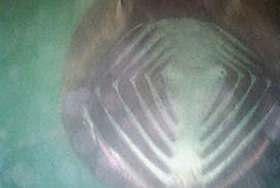 The most important bit of a basking sharks brain is two long thin stalks that look a bit like two dandelions on stalks. These bits work out the smell and taste of what is in their mouth. 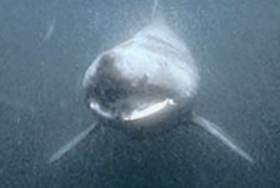 Basking shark have very big dorsal fins on their backs. They are up to 2 m high, that is taller than your dad! Basking sharks eat shrimps for dinner every meal of their lives. they have to filter LOTS of water to get enough to eat. 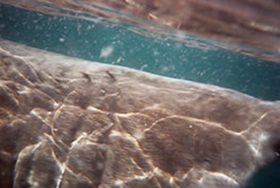 An average-size basking shark could filter enough seawater to fill a swimming pool in just one hour! 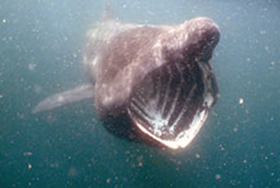 Basking sharks visit the Isle of Man in the summer, between mid May and mid-August when the water is full of plankton. but they have bad wrinkles around their mouths! Don’t mention the fish lice near their gills! Quick, call for the flea shampoo! They ‘fly’ through the water using their big pectoral fins like aeroplane wings to steer. They can look toothless and quite, quite, harmless. Don’t forget, they ARE sea monsters so keep looking and enjoy yourselves!